Fecon Australia offers a diverse range line of hydraulic skid steer mulchers. 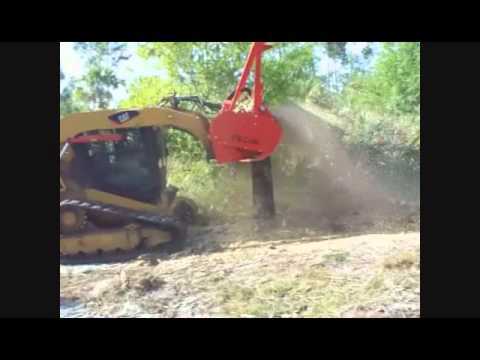 These skid steer mulcher attachments are ideal for high flow SSLs and CTLs to clear brush, trees and stumps down to ground level. Suitable for use with ably powered wheeled skid steers, tracked skid steers (positracks), bobcats, and mini loaders. The Bull Hog for skid steers is offered with either FGT (drum) or DCR (depth control) rotors. FGT rotors come standard with double carbide tools and can be equipped with two optional tools for more abrasive or rocky applications, or equipped with knife tools for faster cutting and finer particle sizing. Aggressive counter cutting rake tines contribute to excellent material sizing and performance. Push Bar Pin-On Serrated Ears direct material to better feed the Mulcher. The optional trap door to Contain Debris and Achieve Finer Sizing. FGT Rotor System: The FGT rotor system is a drum-style configuration featuring a smooth rotor surface, spiral tool pattern, and innovative tool shape for smooth, efficient cutting. In addition to outstanding performance, the FGT rotor system is built to last in the severe application of mulching. DCR Rotor System: The Fecon DCR brings a superior level of performance and value to mulching, controlling the depth of bite and directing material flow so that energy is reserved for production. The innovative DCR cuts quickly, delivering better fuel economy and more uniform particle size. All models are available for sale or hire – please enquire for details.